Our young Egyptian friends (a sort of “leftist liberal revolutionaries”) consider the post-July 3 events in their country [the ousting of president Morsi by the military] as “counterrevolution”. And I would tend to agree with them – though not without certain qualifications. Almost by definition, revolutionaries regard the “counterrevolution” as something unequivocally negative; whereas we believe that the present-day political regime has serious positive respects (though, no doubt, its formation has led in the recent months to a significant growth of the authoritarian tendencies). Yes, it may well be denoted as “counterrevolution”, as it returned to power that very block of military, economic, and bureaucratic elites that had ruled the country before the 2011 Egyptian Revolution. However, as we have already demonstrated this before, it ruled Egypt in a rather effective way, securing in the years preceding the Revolution a rather successful (especially, against the global background) economic and social development of this great country. However, it would be wrong to say that Egypt has returned now precisely to that very state where it was before the revolution. And some newly emerging features contribute evidently to the regime destabilization. This is first of all the radicalization of the Muslim Brothers coupled with the emergence of their very strong media support in the form of al-Jazeerah’s satellite channel “Mubasher Misr”. On the other hand, there are much more of those features that have emerged during the Egyptian Revolution and the Egyptian Counterrevolution that contribute to the regime stabilization. First of all, this was a very strong elite conflict (that is important for the success of revolutions in general and that was especially important for the success of the Arab Revolutions in 2011). This was mostly the conflict between the Egyptian military (“the old guard”) and the economic elite (“the young guard”) – a group of the leading Egyptian businessmen headed by Gamal Mubarak (son of Hosni Mubarak). The military group controlled (and continues to control) not only the Egyptian Armed Forces, but also a major part of the Egyptian economy. And these are not only military factories, but also large pieces of land, various real estate, fuel stations, construction and transportation enterprises, as well as various factories that produce not only military production, but also things like TV sets, refrigerators, spaghettis, olive oil, and shoe cream (note also that military factories – virtually possessed by Egyptian generals – have a clear competitive advantage, as they can exploit virtually free labor of the conscripts). Estimates of the share of the Egyptian economy controlled by the military range between 10 and 40% (however, the latter estimate appears to be exaggerated). This group of the Egyptian elites was frightened by the ascent of the “young guard” of the leading Egyptian businessmen (under the leadership of Gamal Mubarak) who controlled the economy block of the Egyptian government. Since 2004 this government had been implementing rather effective economic reforms that led to a significant acceleration of economic growth rates in Egypt. “Over the past decades, the Egyptian military has not limited its focus to security matters; it has also acquired valuable real estate and numerous industries. 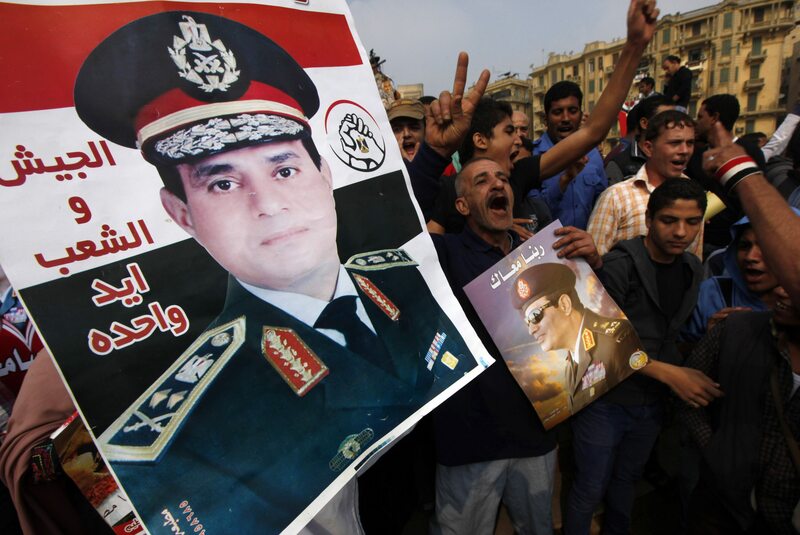 By one estimate, the military commands up to 40 percent of the Egyptian economy. Before the events of 2011, Egyptian officers expressed concern about President Mubarak’s plan to appoint his son Gamal as his successor. If Gamal took office, many believed that he would implement privatization policies that would dismantle the military’s business holdings”. Indeed, there were all grounds to expect that if Gamal Mubarak were to come to power, the leading Egyptian businessmen from his circle would establish an effective control over the generals’ economic empire – and it would be rather easy to justify this indicating (quite real) ineffectiveness of exploitation of the respective economic assets and the need to optimize it. The Egyptian elite conflict allows us to understand some events of the Egyptian Revolution that may look mysterious at the first glance. For example, throughout the revolution the army guarded quite rigorously all the official buildings, effectively blocking all the attempts by the protesters to seize them. 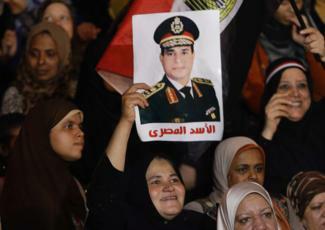 However, already on the first days of the Revolution (on the 28th and 29th of January, 2011) the army allowed protestors to seize, crash, and burn the headquarters of the ruling party of Mubarak’s Egypt – the National Democratic Party. However, a closer inspection suggests nothing strange – as the real head of this party was Gamal Mubarak; thus, the military elite delivered a very strong blow upon its archenemy with the hands of the protestors. A Christmas cartoon. 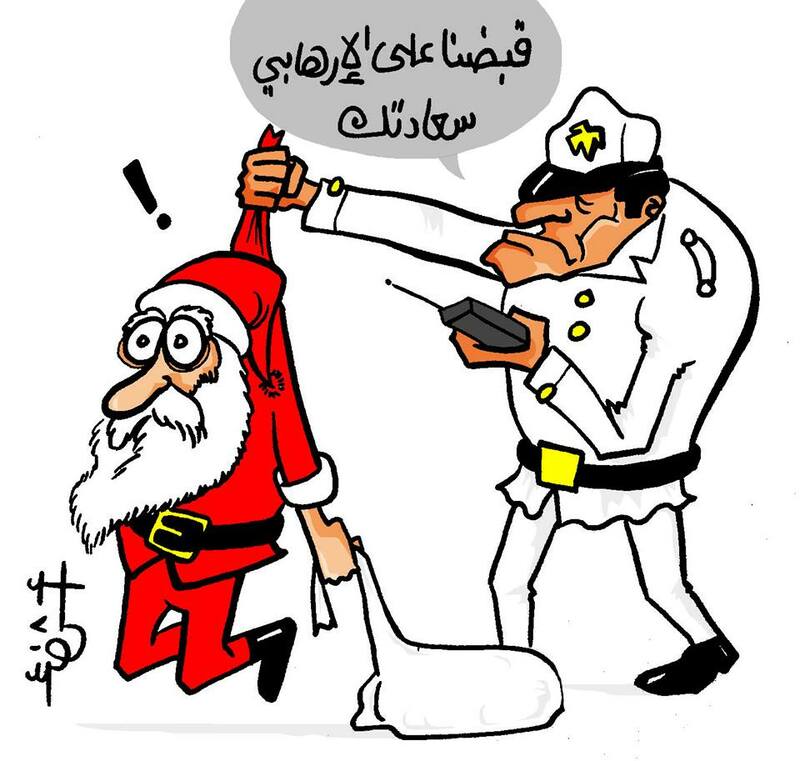 The policeman reports to his boss: “Your Honor, we caught a terrorist.” Commentary: anybody with a long beard in today’s Cairo is perceived as a Muslim Brother. Source. Within the context of the still rather fashionable interpretation of the Egyptian events of January and February 2011 as a “confrontation between revolutionary masses and the repressive authoritarian regime” one could hardly understand the apparently enigmatic (but extremely famous) “Battle of the Camel”, when there was an attempt to disperse the Tahrir protesters on the part of a motley crew of cameleers – workers of tourist services operating in the Pyramids area and engaged in renting horses and camels to tourists. 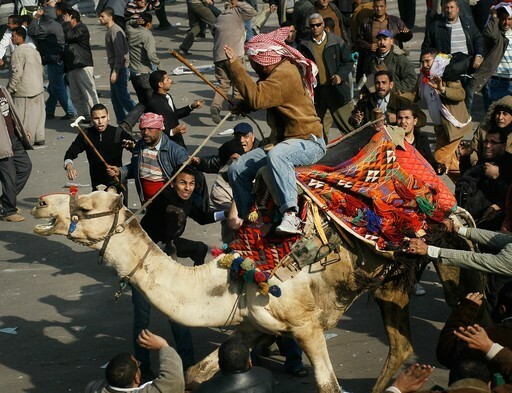 The cameleers attacked the protesters while riding camels and horses (which, incidentally, lent an exotic color to events of February 2 – and to the Egyptian 2011 Revolution, in general). However, if this was indeed “the confrontation of popular masses and the repressive authoritarian regime”, why was it necessary for the “authoritarian regime” to employ such strange amateurish figures, and not to use, simply, the professional repressive apparatus? The point is that already on the 2nd of February Tahrir protesters confronted not the professional repressive apparatus controlled by the “old guard” (that took the position of friendly neutrality toward the protesters), but the economic elite clique that in order to counteract the protesters (who demanded the removal of the businessmen’s leader) had to employ semi-criminal elements rather than professional repressive apparatus. Thus, already in early February 2011 the protesters in Tahrir were countered not by the repressive apparatus of the authoritarian state, but by a clique of the businessmen who were very rich, but who did not control the repressive apparatus – which accounts for a very easy “victory of the revolutionary masses”. As I wrote in the first part, one factor underlying the success of the 2001 Egyptian Revolution was strong intraelite conflict. The second factor that lead to an unexpectedly fast success of the protestors was the formation of a wide opposition alliance, which united in a single coordinated front very diverse forces including not only all the possible secular opposition groups (liberals, leftists, nationalists and so on), but also Islamists in general, and the Muslim Brothers in particular. The situation that we observe now is exactly the opposite. Firstly, the Egyptian Revolution made the Egyptian economic elite reconcile with the military, and in June 2013 they acted together in a well-coordinated front that allowed such a swift overthrow of President Morsi. No serious cracks in the new coalition of the Egyptian military and economic elites (that was formed in the first half of 2013) appear to be visible yet. The economic elites have understood that for them it turns out to be extremely counterproductive to continue any serious attempts to get hold of any economic assets controlled by the military, that it is much better for them to recognize the dominant position of the military in the ruling block, as well as the immunity and inviolability of the generals’ economic empire (among other things – through direct constitutional amendments). The economic elites have understood that any serious attempts on their part to get dominant positions in the ruling block may result in their losing incomparably more than gaining (emergent cracks in the ruling coalition are rather connected with the participation in this coalition of some leftist secularists – first of all, Hamdeen Sabahi and his Egyptian Popular Current [al-Tayyar al-Sha`biyy al-Misriyy]), whereas the continuation of the cooperation of this part of the ruling alliance with both military and [especially] economic elites can in no way be guaranteed – one would rather expect to see eventually the final split between the left-wing and right-wing secularists in Egypt). Secondly, the Revolution with the subsequent Counterrevolution led to an extremely deep split in the January (2011) opposition “macroalliance”. What is very important is that this split took place along many lines. Within the overall macroalliance even the Islamist alliance was split, because the July 3 coup was supported by the second strong Islamist party – the party of Islamist fundamentalists/salafis Hizb al-Noor (as well as a number of prominent Islamic figures outside this party). Of course, the support of secularist-military regime by the Egyptian Salafi Islamists needs a special commentary (a special commentary is also naturally needed for the fact that in July 2013 the archconservative Islamist Saudi Arabian regime acted as a faithful ally of the anti-Islamist alliance that included an exceptionally wide range of forces – liberals, nationalists, leftists, ultraleftists – up to Trotskyists. The main point here appears to be connected with the fact that Saudi Arabia acts as the main financial sponsor of Hizb al-Noor. And as regards Saudi Arabia, the Muslim Brothers pose a real threat to the respective country’s regime. In 1937 in the USSR it was much less dangerous to proclaim oneself a Slavophil rather than a Trotskyist (in 1937 the latter [but in no way the former] would have led to an almost immediate execution) – whereas for non-Marxists the difference between Stalinists and Trotskyists could look entirely insignificant. Similarly, for the Saudis Trotskyists are a sort of unreal exotics, whereas the Muslim Brothers for them are almost the same as the Trotskyists were for Stalin – they are precisely those leftist Islamists who question effectively the very basics the regime legitimacy and may even take concrete steps to overthrow it. And against such a background one can easily understand the readiness of Saudi Arabia (and the UAE and Kuwait, which have similar problems) to ally with anybody (including anti-Islamist minded liberals and Communists, let alone Egyptian military and economic elites) in order to weaken in its own homeland the enemy that threatens the very survival of the Arabian monarchy (with the natural exception of the Qatar monarchy). On the other hand, for the Egyptian Salafis the removal of the Muslim Brothers from the legal political arena was somewhat advantageous (irrespective of any connections with the Saudi interests), as it allows to strengthen significantly their own positions, including the potential further widening of its presence in the Egyptian parliament – as the present-day main legal Islamist party of the country.